Looks like this Lefty is headed for destruction. And Maxwell’s island just got smaller. 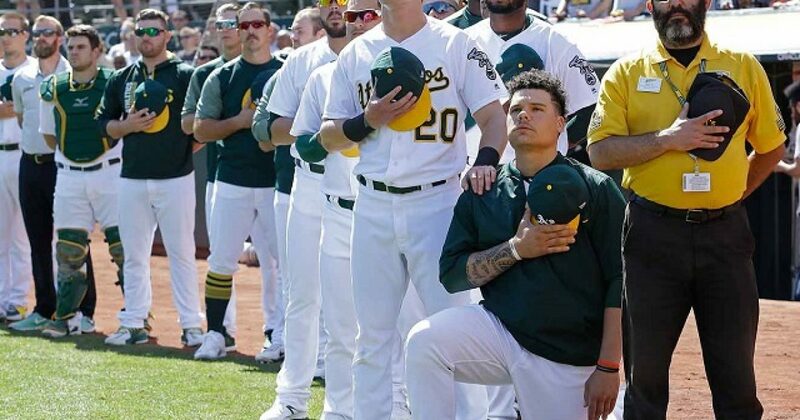 Bruce Maxwell, the only Major League Baseball player to kneel during the national anthem this season, has been arrested on a gun charge. The Oakland Athletics catcher allegedly pointed a gun at a female food delivery person in Scottsdale, Ariz.
You can bet the “female delivery person” was white. Ironically, Maxwell appears to be more white than black. I’d certainly like to get his DNA profile to see just how much oppression this young man experiences. From all accounts, Maxwell’s oppression seems mostly self-inflicted. Last week, Maxwell claimed during a visit to his hometown of Huntsville, Ala., that he was refused service at a restaurant because of his protest. But a waiter told Fox News that Maxwell was “outright lying,” about what happened. “I didn’t even know who Bruce Maxwell was,” waiter Matt Henry said. The A’s projected the 26-year-old to be their starting catcher next year. However, I suspect the team may be rethinking its position on that. Details surrounding the firearm are unavailable at this time. It appears that Maxwell, like most of the social justice warriors is looking for trouble, since none really exists in his life.